With the August signing deadline having come and gone close to two weeks ago, taking the time to look at which teams chose to spend big on the draft and those that took a more conservative approach is always an interesting task. Baseball America does a fantastic job of covering the draft every year, and I recommending checking out the series of posts they ran covering draft spending this year. But sometimes I find it easier to view this type of data visually. There will be some differences between BA’s numbers and mine. First, Baseball America limited what they considered draft spending to bonus totals. In the graphs that follow, I incorporated all spending. For example, the Mariners signed Daniel Hultzen to a major league deal worth at least $8.5 million. As part of that deal, Hultzen received a bonus worth $6.4 million. Baseball America would record the Mariners as spending $6.4 on Hultzen, I record them as spending $8.5. I don’t think either way is necessarily right, they’re just different. The second difference is that BA’s numbers are going to be more accurate, as they do an excellent job of collecting a tremendous amount of data on player bonuses. I wasn’t able to find information on every player who signed, so my numbers will underestimate how much each team actually spent on the draft. That being said, the numbers shouldn’t differ to such a degree that the analysis is substantially affected. I believe I’ve included all major signings, and the relative order of team spending is similar to BA’s list. The y-axis gives an indication of how much each team spent on the draft this year, while the x-axis gives an approximation for how widely each team spread their spending. The thick blue line represents the mean amount that teams spent, and each dashed blue line represents a standard deviation from the mean. The first thing that jumps out to me is just how much money the Nationals and Pirates spent. The Pirates signed their second round pick, Josh Bell, for $5 million. With Bell’s signing alone, the Pirates spent more on the draft than over a third of all major league teams! Unsurprisingly, with so many extra picks in the early rounds, the Rays and Jays both spread their draft dollars around. On the other side of the coin, The Diamondbacks limited much of their spending to Trevor Bauer, Archie Bradely and their supplemental first rounder, Andrew Chaffin. Another thing that jumped out to me was that, even without any extra picks, the Royals were active. In any other year, the Royals would likely be the talk of the draft, but it appears they were somewhat over-shadowed by the Pirates’ and Nationals’ spending sprees. On the opposite end of the spectrum, the Rangers are a surprising team to see toward the bottom of the list, given the team’s recent history of being fairly aggressive in the draft and the fact that they had a supplemental first round pick. I wouldn’t be surprised to see the Rangers divert some of their draft savings to the international free-agent market. Of course, the Rangers may have used some of their draft budget to sign Leonys Martin. My hope with this graph is to represent how much each team spent compared to what we would expect them to spend based on the number and position of their selections. The y-axis still represents total spending, but the x-axis is now an estimate what each team would pay in the first ten rounds if they paid slot for each pick. Major league baseball only recommends slot for the first five rounds, but I simply extended the data into the tenth round to come up with a rough estimate. The line in the graph is a plot of a less regression equation. 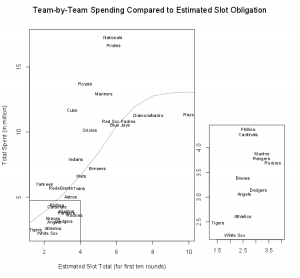 Teams above the line spent more than what we would expect the average team to spend, given the same picks. Teams below the line spent less. 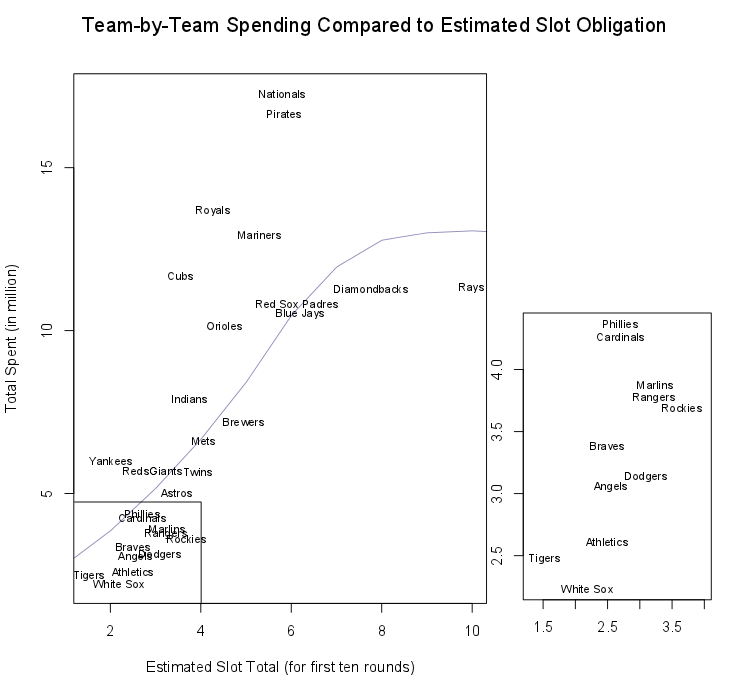 There are certainly some limits to this method, but the graph gives us a fairly decent representation of which teams went out of their way to spend. Although the Red Sox, Padres, Blue Jays, Diamondbacks, and Rays all ranked near the top of the list in draft spending, given how many picks each team had, none of those teams spent a surprising amount. 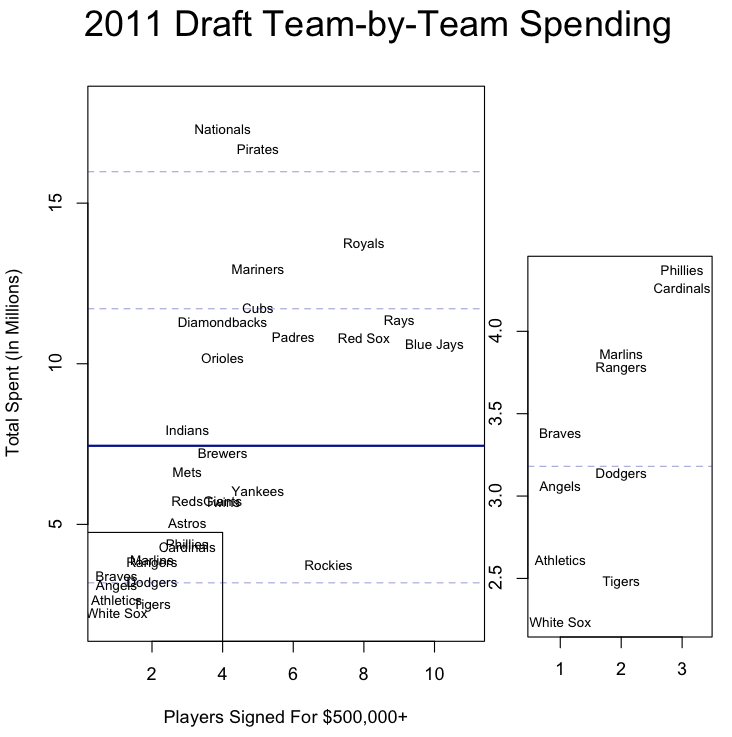 One of the reasons I like this graph is it shows just how much the Nationals and Pirates spent. Even if you assume that an early first rounder’s bonus will exceed MLB’s slot recommendation by a substantial amount, the regression suggests the Pirates and Nationals would spend a similar amount to the Red Sox, Jays, and Padres, but the two groups aren’t even close. This graph has the same axes as the previous graph, but the size of each team’s circle represents the percentage of that team’s spending that occurred after the tenth round. 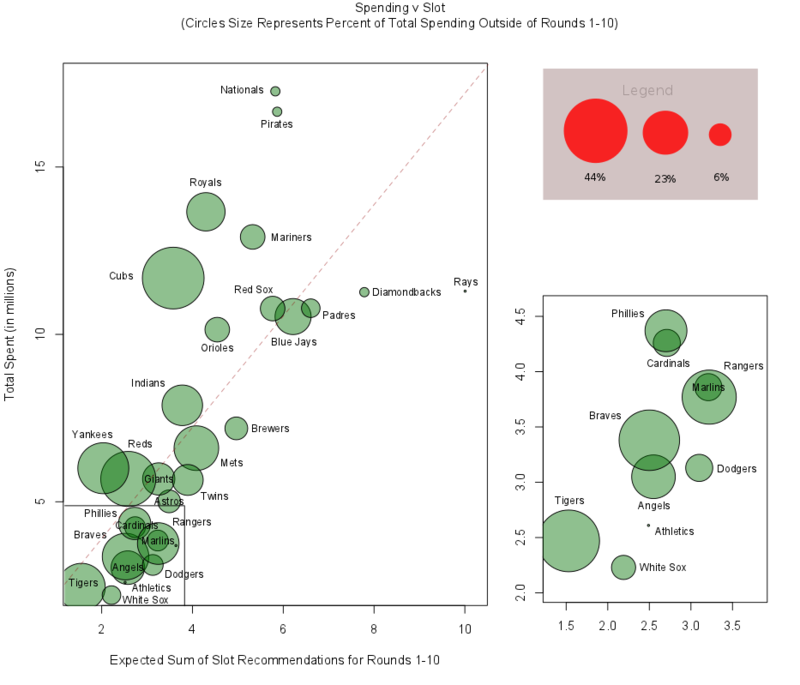 Larger circles indicate a higher percentage of the team’s spending went to players drafted after the tenth round. The sizes of the circles in the legend are based on the Cubs’, Mets’ and Astros’ spending. The Cubs are the big outlier in this graph. Most of the bigger circles belong to teams in the bottom-left portion of the graph, as just a few over-slot signings after the tenth round would constitute a sizable portion of these team’s overall draft budgets. But the Cubs not only spent a substantial amount overall, they spent the highest percentage of their total budget signing players outside of the first ten rounds. The Cubs signed 14th rounder Dillon Maples, who Baseball America ranked as the 46th best prospect in the draft, for virtually the same amount as they signed their first rounder, 9th overall selection Javier Baez. The Cubs also nabbed 11th rounder Shawon Dunston Jr for north of $1 million dollars. Although the Cubs were outspent by four teams, there is certainly an argument that they were one of the most aggressive teams in this year’s draft. 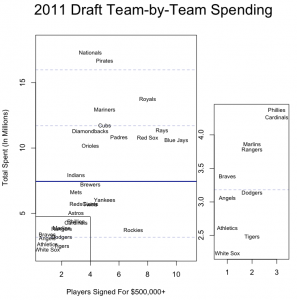 We hoped you liked reading Visualizing 2011 Draft Spending by Reed MacPhail! I think it’s interesting that the Jays spent about what they would be expected to spend based on slot, except they were the only team not to sign their first round pick. If Beede takes the $2.5M he was offered, the Jays become one of the bigger spenders in the draft. Sorry, I didn’t make what the regression line represents clear enough. The Jays spent well more than than slot, overall. But they spent an average amount compared to what we would expect the average team to spend given the same draft picks. The Padres are somewhat similar except that their unsigned pick was a Compensation rounder. It does sound like they didn’t offer Brett Austin a huge amount though so they wouldn’t have shot too far up but far enough to make them top 5. Supposedly they offered Brett Austin 1.5m. Hoyer made it sound like he wanted him even after getting Hedges, but who knows if that offer exisited once Hedges signed.